$13 billion U.S.S. GERALD R. FORD -- HUNTINGTON INGALLS INDUSTRIES left out eleven (11) elevators required to bring bombs to deck. The Pentagon encouraged mergers, resulting in this Northrop Grumman spin-off having U.S. monopoly on making aircraft carriers. Monopolies are unAmerican. Unjust stewards in Washington, D.C. have promoted monopoly power in a few hands. Major General, U.S. Army (Ret.) and CEO of MINACT Inc. Retired president and CEO of Centrus Energy Corp.
Former Chief Financial Officer, RJR Nabisco, Inc. The $13 billion Gerald R. Ford aircraft carrier, the U.S. Navy’s costliest warship, was delivered last year without elevators needed to lift bombs from below deck magazines for loading on fighter jets. Previously undisclosed problems with the 11 elevators for the ship built by Huntington Ingalls Industries Inc. add to long-standing reliability and technical problems with two other core systems -- the electromagnetic system to launch planes and the arresting gear to catch them when they land. The Advanced Weapons Elevators, which are moved by magnets rather than cables, were supposed to be installed by the vessel’s original delivery date in May 2017. Instead, final installation was delayed by problems including four instances of unsafe “uncommanded movements” since 2015, according to the Navy. While progress was being made on the carrier’s other flawed systems, the elevator is “our Achilles heel,” Navy Secretary Richard Spencer told reporters in August without providing details. The elevator system is “just another example of the Navy pushing technology risk into design and construction -- without fully demonstrating it,” said Shelby Oakley, a director with the U.S. Government Accountability Office who monitors Navy shipbuilding. Problems with the elevators add to questions about the Navy’s plan to bundle the third and fourth carriers in the $58 billion Ford class into one contract. It’s part of the service’s push to expand its 284-ship fleet to 355 as soon as the mid-2030s. Congress gave the Navy permission for the two-at-once contract in this year’s defense spending and policy bills despite the unresolved technical issues and the lack of a Navy estimate so far of how much money it would save the service. Deputy Defense Secretary Pat Shanahan continues to review the contracting plan. 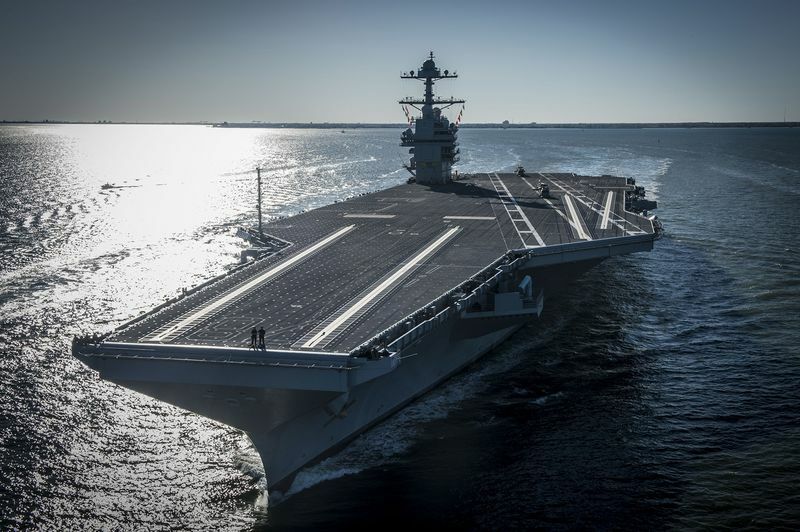 The Navy says that the first carrier will be fully combat-capable, including the elevators, by July -- the end of its current 12-month pier-side shakedown period in Virginia. Navy weapons buyer James Geurts cited what he called “considerable progress” on the Ford, including on the elevators, in a July 6 memo to Pentagon acquisition head Ellen Lord. The Navy in May requested permission from Congress in May to increase the Ford’s cost cap by $120 million, partly to fix elevator issues “to preclude any effect on the safety of the ship and personnel.” The safety issues related to the uncommanded movements, the Navy said in an email. Beci Brenton, a spokeswoman for Newport News, Virginia-based Huntington Ingalls, said “all the elevators are installed.” She said the weapons elevator is among “the most advanced technologies being incorporated into” the carrier and “its completion has been delayed due to a number of first-in-class issues,” Brenton said. “We are committed to working through the remaining technical challenges,” she said. Six are far enough along to be operated by the shipbuilder, and testing has started on two of those, he said. All 11 “should have been completed and delivered with the ship delivery,” according to Couch. A November 2010 program on PBS’s “Nova” science series extolled the “Elevator of Tomorrow” being developed by Federal Equipment Co., a Cincinnati-based subcontractor to Huntington Ingalls. Doug Ridenour, president of Federal Equipment Co., said the elevator’s key technologies “have been consistently demonstrated for years” in a test unit in the company’s plant and any programming or software-related issues have been fixed. But “shipboard integration involves many other technology insertions not controlled by” his company, he said.